Hosted by the Junior Junior League, “Get Involved Volunteer Early” events promote volunteerism. It’s never too early to teach your child how to give back to the community. In fact, promoting charitable giving within a family is a wonderful way to pass on important values such as generosity, integrity, compassion, community, love and gratitude. 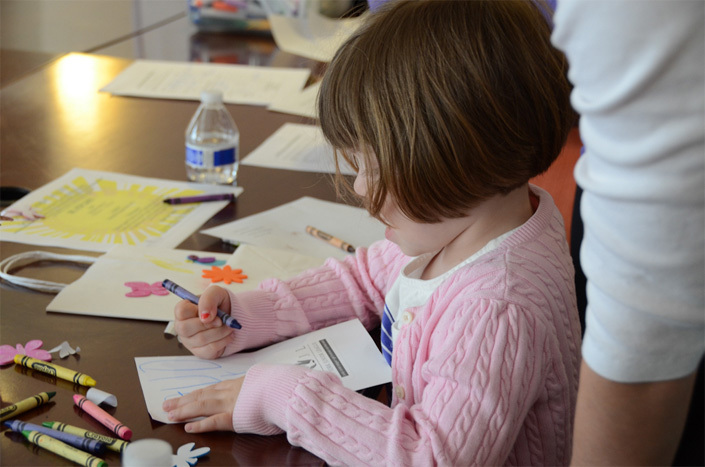 The NYJL’s Junior Junior League (JJL) committee promotes an early appreciation of volunteerism in children through Get Involved Volunteer Early (GIVE) events. GIVE events are designed to be educational, dynamic, and engaging. Children learn about giving back, develop their philanthropic interests, and participate in different types of volunteer activities. Additionally, the events provide parents and their children with meaningful opportunities to serve the community together. “I grew up volunteering and knew I wanted my daughter to be aware that small things can make a big difference,” says Katrina Hennigan, JJL co-chair. Katrina brought her daughter to a JJL GIVE event in partnership with Search and Care, an organization whose mission is to help frail and isolated older people live safely and independently in their own homes. The children hand-delivered decorated cards and gift bags containing a plant, scarf, and crossword puzzle book to elderly residents of the Upper East Side. “I talked to my daughter on our way home about how a visit and gift bag can make a big difference in someone’s day, including our day,” says Katrina. All GIVE Events are free of charge. For more information, please email jjrleague@nyjl.org.